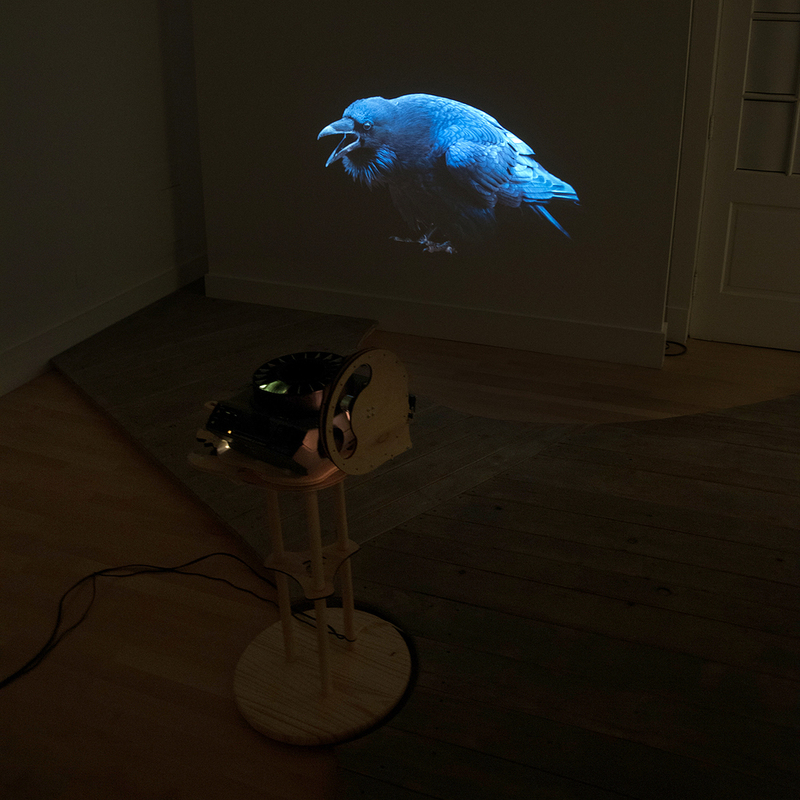 Walter Kitundu is a Bay Area artist, instrument builder, photographer, performer, designer, avid birder, and former Bolinas resident whose recent work combines analog mechanical wizardry with a passion for birdlife. Inspired by walks through the forest, Kitundu has transformed the gallery into an immersive site-specific kinetic photography installation where the random footsteps of each visitor trigger the whir, hum and click of an assembly of vintage slide projectors and the flight of Bay Area birds from a collection of over100 slides of photographs taken by the artist, making each walk-through unique. 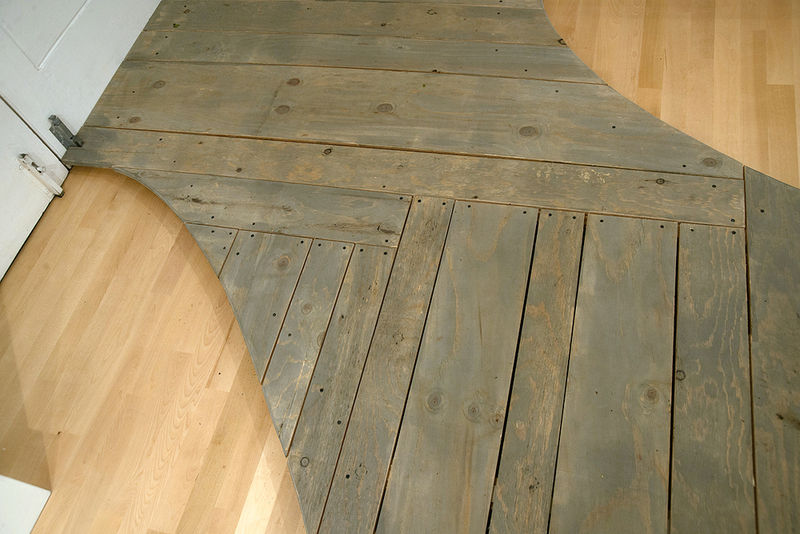 Like the Richard Wilbur poem that inspired the title of the installation, Kitundu’s work calls our attention to the natural world and makes us pause and reconsider how chance informs our daily experience and place in the natural order of things. "Whenever I wander through the woods I'm struck by the constant surprises and changes of pace and possibility," says Walter Kitundu--an experience he meticulously interprets here by shaping wood, Walter is most well known as the inventor of a family of Phonoharps, multi-stringed instruments made from record players that rely on the turntable's sensitivity to vibration. 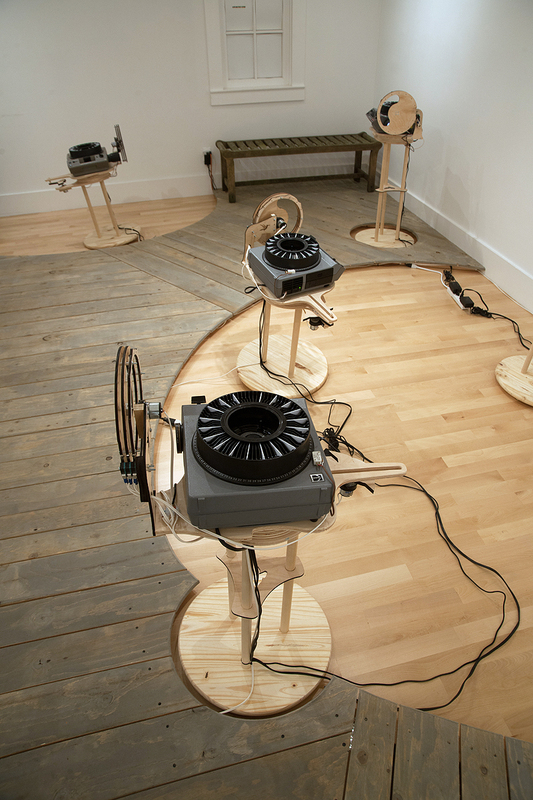 As an artist he has created hand-built record players powered by the wind and rain, fire, birds, light, and ocean waves, for which he received a MacArthur Fellowship in 2008. As a musician, he has collaborated with such renowned musicians as the Kronos Quartet in venues worldwide including Carnegie Hall. 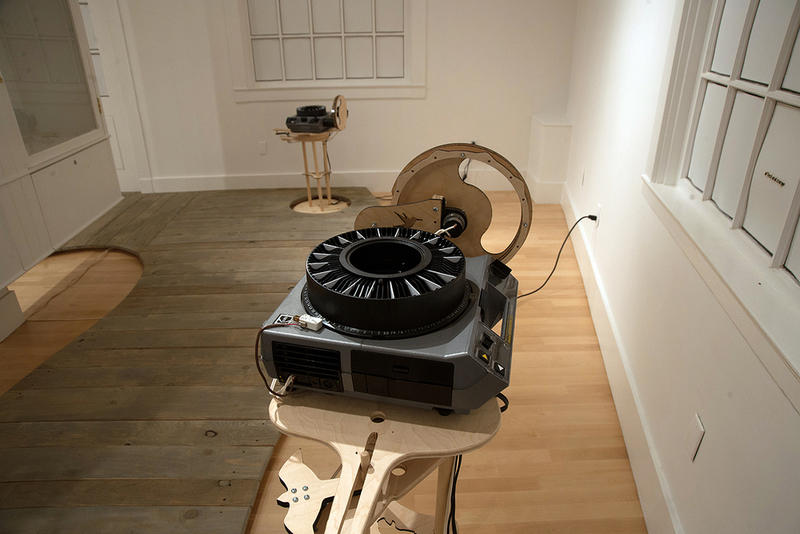 The Bolinas Museum is honored to present Walter Kitundu’s first solo museum exhibition featuring work beyond his famed record player inventions. We hope you will enjoy it and come back often with your friends and family. Like a walk on the beach or through your favorite glen, no two visits will ever be alike. An early sketch imagining what the show might be like. WALTER KITUNDU had his camera focused on a hummingbird in San Francisco's Alta Plaza Park when a red-tail hawk flew over him. Intrigued, he returned to the park a few more times to look for the bird. "One day it flew straight at me and landed on the ground 4 feet away from me and ate a caterpillar. We just sat there together for about a minute. Someone else walked by, and it flew off. But I was totally hooked," says Kitundu, who called the bird Patch. And that's how the 40-year-old former Bolinas resident added bird photographer to a resume that includes being the inventor of the phonoharp and other wildly imaginative instruments for groups such as San Francisco's Kronos Quartet, a visual artist, hip-hop DJ, senior designer at the Exploratorium's Learning Studio and a recipient of a MacArthur Foundation "genius" award in 2008. "I'm not necessarily interested in seeing a lot of species but I'm really interested in seeing intimate, close looks at particular birds and really getting to know how they live their lives through my photographs," he says. "I've been privy to some pretty interesting behaviors." His years of observing birds — often perched on rocks or under trees in the wind and cold — is the subject of a new photography-based e-book, "Bird Knowledge: Little Life Lessons Learned from Birds," and a site-specific installation at the Bolinas Museum, "The Ceiling of Our Day," through June 1. "They teach you an awful lot. They teach you about patience, obviously, but certain things are more subtle," says Kitundu, who now lives in Oakland. "They taught me to pay attention to the light and the temperature and the wind in a way that makes me feel a little more connected, a little more aware about what's going on. "... I always say birds are the best bird watchers. When you're watching them, they will show you everything that's going on in their surroundings because their survival depends on it." Like the time he followed the gaze of a great blue heron in San Francisco. "It looked up and I looked up to where it was looking and sure enough, there was a golden eagle flying over the city," he recalls. More than 100 of his bird photographs are being featured at the Bolinas Museum, but rather than just hang on them framed on the walls, the photos are part of an installation that — like just about everything he does — is kinetic. 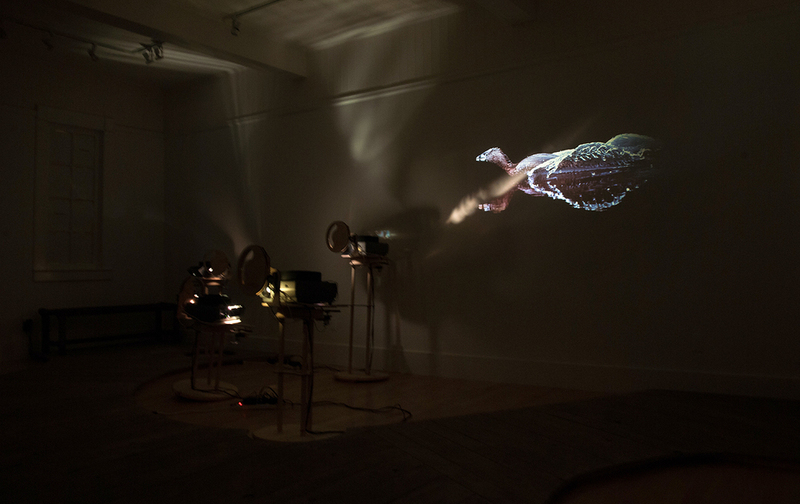 As visitors enter the darkened room, their footsteps trigger an assembly of vintage analog projectors, which he rigged with wooden gears, that display the flight of different Bay Area birds, making each walk-through an entirely different experience. He wanted to re-create the experience — the opportunities and missed opportunities — of bird watching. "I've been taking photos of birds for years now and it's often a solitary endeavor. In wanting to share the images, it wouldn't feel complete to put them on the wall out of context," says Kitundu, who volunteers in the Golden Gate Raptor Observatory's banding program. "I wanted to try to figure out a way to make it an active, engaging, physical, dynamic experience that wouldn't be the same each time you came through. When you're in nature, it never really repeats itself. Birds are creatures of habit, but they're always open to the demands of the moment." Born in Minnesota, Kitundu spent eight formative years in Tanzania. His grandmother gave him a book on bird anatomy when he was a child. "I was completely fascinated by it for a few years," he says. But it wasn't until he started working at the Exploratorium several years ago that he started taking photos of the gulls and herons on his breaks. Then a friend gave him a book on birds of Northern California "and this whole interest that had been lying dormant just re-emerged and then all of a sudden I was back into birds in a big way." 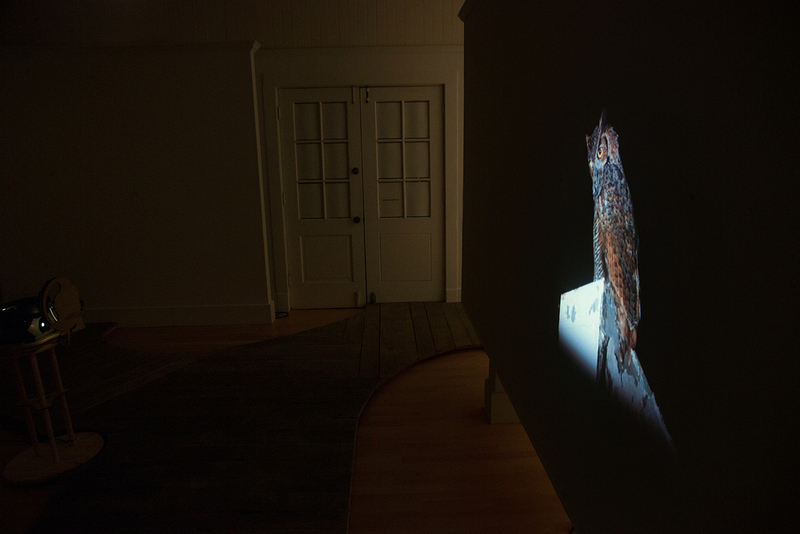 The trick to seeing his Bolinas Museum installation, he says, is to move slowly and be observant — just as if you were observing a bird in the natural world. The images flash quickly — every four seconds. "The point of art is often the creation of something beautiful and the definition of beauty is wide-ranging, but I'm hoping people have a beautiful experience," he says.